If you are planning on applying to a veterinary technician school, it’s a good idea to familiarize yourself with common admissions requirements. Knowing what is generally expected from applicants will help you organize and prepare yourself, and it will also help you increase your odds of being accepted! The list below is a general list that may or may not apply to the vet tech school you are considering. Always check with the admissions department to obtain an official list of requirements. Application fee: Ranging from $20-$100, most vet tech schools require you to pay a non-refundable fee when you turn in your application. Point systems: Some vet tech programs use point-based evaluation systems to help them sort through candidates. What this means is that the program organizers assign point values to different requirements in order to objectively rank applicants. For example, academic performance may be worth 60 points, 20 points for veterinary experience, 10 for reference letters from a vet or vet technician, and so on. Check with the vet tech program you are applying to to see if they use a points-based system. If they do, they’ll be able to tell you how many points each requirement is worth. This will help you identify which parts of the application are the most important and deserving of your time! Academic requirements: This is one of the requirements that varies widely from school to school. In general, most vet tech programs want to see a High School diploma, college transcripts, or a GED. In addition, most programs require at least a 2.0 GPA, though more competitive schools look for students with an upper-third class rank. Some vet tech schools may assess your cumulative GPA and your cumulative math and science GPA separately. I have also seen a few programs that assess only the GPA of only your most recent credit hours. Applicants must generally submit their SAT or ACT scores as well. Class pre-requisites: Again, this is another requirement that can vary widely among programs. Most want to see evidence of satisfactory performance during multiple semesters of math, science (chemistry and biology), and english courses. Check with the program you are considering to find out their minimum high school prerequisites. Veterinary experience: This is a common and important requirement that can really make or break your chances of being accepted to the vet tech school of your choice. Although it is not always mandatory, hands-on work experience with a veterinarian either as a volunteer or paid employee is usually strongly recommended. 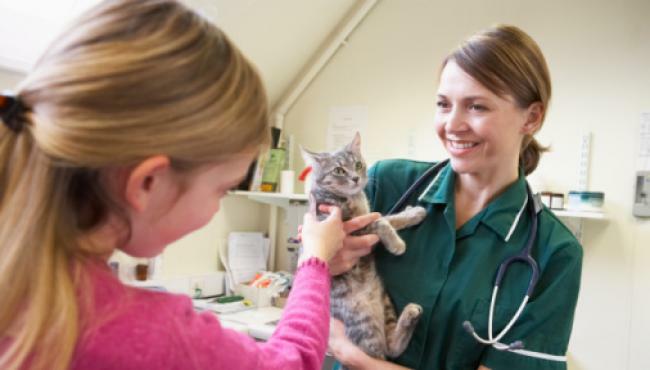 Veterinary experience is usually defined as any hours spent volunteering, observing or working under the supervision of a vet or a licensed veterinary technician. Total number of hours is important, but the quality of hours may be even more important. For example, a school would rather see you spend 50 hours shadowing a vet tech than 100 hours cleaning kennels. Letters of recommendation/Evaluation forms: A majority of programs typically require any where from 1 to 3 letters of recommendation. Usually at least one of these letters has to come from a veterinarian or licensed veterinary technician. Other letters should come from someone such as a teacher, professor, academic adviser, or counselor. Don’t use friends or family members to fill this requirement. Application essays: Many applications have an essay component that gives you a chance to talk a bit more about yourself and set yourself apart from the competition. Don’t be frustrated or intimidated by the essay – embrace it as your best chance to really stand out and guarantee your acceptance! The essay may be of a personal or professional nature, but is usually a combination of both. Many essays are designed to demonstrate the applicant’s knowledge and understanding of the veterinary health care team and the skills and qualities necessary to be a successful member of that team. Application essays tend to be evaluated based on how well the questions are answered in addition to how clearly you express your thoughts. Communication skills are essential to being a good vet tech, and schools want to see that you possess those skills! That’s it! These are the common admissions requirements for most veterinary technician programs. As mentioned before, you should absolutely check with each specific program to obtain an official list of requirements. It’s highly recommended you do this long before you are ready to apply, this way you can ensure that you have everything you need: veterinary experience, letters of recommendation, etc. Good luck! This entry was posted in Becoming a Vet Tech and tagged Vet Tech Admissions Requirements, Vet Tech Program, Vet Tech School, Vet Tech School Admissions on July 22, 2010 by admin1.